I love fall fashion. It is probably one of the more exciting seasons for fashion lovers. The magazines are always thicker and the runway buzz is always full of hot stories about the industry. September is packed for the fashion industry professionals and lovers. Fashion’s Night Out leads to New York Fashion Week, which in turn brings London Fashion Week. It is back to back visual candy. With all the trend reporting and style makers commenting about the Spring 2013 collections, it is often overlooked that we are starting Fall. Denim, Layers, and hoodies – does life get any better for the styled man? All the lookbooks and previews can be a little overwhelming. If I was to pick ONE fall show to be a standard for Fall 2012 men’s wear, it would be the show presented by the always exciting Dsquared2. There are few collections that I literally cannot wait to check out; Dsquared2 is one of them. They always get men’s styling and know how to make guys look good without having to try really hard. For those who like some good visual stimulation I posted the Fall video lookbook on my men’s site: Social Club 19. Ladies there are some hot looks for you out of the collection too. Check it out. Fall is always about layering great pieces to create a well style men’s look. The challenge is making sure not to overdo the layering and making sure you layer the right fabrics. 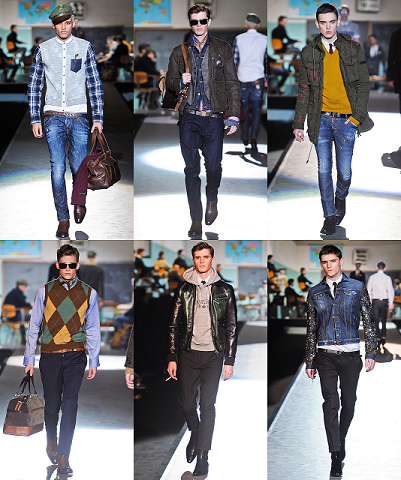 Dsquared2 layered items in all the right ways. Keeping with thin quality fabrics that play with pattern and texture. Denim is without a doubt men’s best fashion friend. It is the one garment that guys are not afraid to wear. Making sure it is the right denim is normally the challenge. A quality raw denim is the recommendation for all men always. There are some great denims out there. Don’t just stop at the pants. A denim jacket is also very popular for Fall 2012. In fact Dsquared2 even gave some ideas for how to DIY your own denim, if you are into that sort of thing. Unlike ladies, guys don’t have to go crazy with accessories for Fall. However guys have to use the right accessories. The safe ones are always: Sunglasses, hats, and scarfs. Just think differently this season. You could always use the safe “aviator” style sunglasses, but maybe this fall go with a cool faux turtle shell round shaped frame. Mix it up gents! Also keep an eye out for cool military inspired pins and accessories to attach to your jackets and sweaters. Don’t have over do it though! Sometimes just a simple pin or fall flower will work. It is totally ok to experiment with your accessories. Well, gentlemen, enjoy FALL! Mix it up, grab your backpack, get a coffee, and have an urban adventure around your city. There is always something to explore!